BERLIN (FinalCall.com)—A national meeting, the first of its kind in the history of Black people in Germany, has been called after the fatal police shooting of a 26-year-old mother of two from Senegal in the south German town of Aschaffenburg in the state of Bavaria. 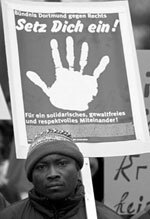 The shooting of Mareame Sarr, in July 2001, during a domestic dispute, brought members of the Black community in Germany onto the streets in protest marches calling for a full inquiry and the sacking of the police officer who fired the fatal shot. The officer said his memory is blank. No public inquiry was ever called. No police officer was put on trial and virtually no German newspaper reported on the shooting or the protests. But the local police and public prosecutor moved with vigor against Sipua Ngnoubamdjum, one of the Black organizers of an officially-approved protest rally. He faces trial and a fine or imprisonment for the breaking of a string of minor regulations during one of the demonstrations. Fifty key Black activists from across Germany were preparing to gather in the little north German village of Lšhne at Final Call presstime. The plan was to draw up a national blueprint on how to fight racism in Europe’s second largest country and build a political organization to take the struggle for civil rights into the Bundestag (Federal Parliament) in Berlin. "The shooting was just one example of what can happen to a Black person in Germany because of institutionalized racism," said Ekpenyong Ani, a member of ADEFRA (Black Women in Germany) and editor at a small Berlin book publishing company. "The police claimed the shooting was in self defense and we did not believe them," she said. Aschaffenburg is a typical west German small town of some 55,000 people. Mareame Sarr is believed to be the first person from Africa to have ever opened a shop in the town. Her newly opened hairdressing and beauty salon was just yards away from a discotheque where African refugees said they are regularly turned away at the door because of their skin color. At the time of the shooting, her marriage was on the rocks and she was separated from her German husband. Her husband, who seven weeks later committed suicide in Switzerland, called police when she turned up at the flat where they had lived, demanding the return of their two-year-old child. He reportedly took the child without her consent. According to police, she ran for a knife during the argument and was shot when she refused to drop it, and lunged at an officer for a second time. A second officer fired the fatal shot in "emergency assistance," police said. "We do not have a lobby. We want to change this situation. We are coming together now to improve our communication and networking so that we become stronger," she explained. One of the major issues to be tackled is how the Black community will actually organize itself to become a new political force that no longer can be ignored in the country. "We have to discuss whether we want a central organization, with democratic structures. One can’t say what the decision is going to be. But the idea is to come out with a blueprint," said Ms. Ani. High on the agenda at the Lšhne meeting will be how to link all Black organizations so they can speak with one public voice on cases of racism, repression and any issue that effects the lives of the estimated 800,000-member community. Names of national spokespeople are likely to be drawn from the 50 activists who will attend and now represent some tens of thousands of Blacks in different German cities. "We have to build the trust first that people are ready to accept that two or three people will speak for them," said Ekpenyong Ani, who feels sure that the conference will decide on spokespersons. These voices will keep pressure on the German press to take notice of such cases as the shooting of Mareame Sarr. "Here the mainstream press only presented the police’s view actually," said Ms. Ani. Conference participants will discuss setting up an array of permanent institutions, such as a national legal defense fund to represent Black people fighting institutional racism and repression before the courts. A first case might be a grant to cover the legal costs of fighting the charges against Mr. Ngnou-bamdjum, who has vowed to take the case to the European Court of Human Rights in Strasbourg. The conference will also discuss the organization and payment of psychological counseling for Black people who have suffered from state repression. This might include treatment for traumatized refugees from Africa who often spend years in remote hostels, isolated from the German community, intimidated and confused by legal regulations that prevent them leading a normal life and moving freely around the country. Linking up with the Black community abroad for support in the fight against racism in Germany will also be discussed. "We’ve already been in contact with the Nation of Islam in London and Min. Hilary Muhammad and the NAACP, the U.S. civil rights organization," said Tahir Della, a prominent activist in the Black German community and speaker at the conference. "They’ve been invited to send representatives. We are reaching out now to organizations all over Europe, especially Austria, Switzerland and England, and also worldwide. The battle for human rights needs to be fought internationally and we need to support each other across national borders," Mr. Della said. At the end of the Oct. 18-20 conference, delegates are expected to gather up the blueprint they agree to and present it to their home organizations. Feedback is likely to be presented at a later second national conference to carry forward the battle for civil rights in Germany and strengthen its emerging political voice for change.